Theology and Rock n Roll: Switchfoot's "World Where I Belong"
I had the chance to see Switchfoot live last night in Charlotte--the second time in the last month. While that might indict me as a groupie, I just saw it as taking advantage of two chances to hear some quality rock n roll from one of my favorite bands. Plus, I looked at the tour dates on the back of my new t-shirt and they're not going to be around here again any time soon. I was impressed at how different the show was, too from just four weeks ago. Some songs from the new Fading West album were worked into the live show and some older songs (Meant to Live, Hello Hurricane, Your Love is a Song) were interpreted in fresh, new ways. It's inspiring to see a band growing and continuing to create even when they're playing a similar play list night after night. My favorite song of the night was the last--World Where I Belong (have a listen above). As the last song on the Vice Verses album, it really completes an album that has a strong future hope emphasis. As I sing along, I hear Augustine's admonitions from the City of God to persevere and be salt and light in the earthly city given our not yet fully realized citizenship in the heavenly city. We press on to grow in Christ and participate in God's mission because of this future hope. 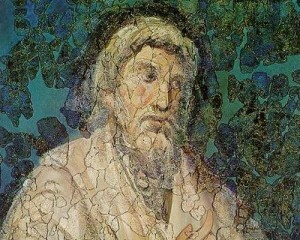 In reading Kapic's Little Book for New Theologians, he adds that we also worship and think about God (theologize) because of eternity: "The praise offered now comes from those laden with anxiety, while in heaven all are free from concern; here there is hope, in glory 'hope is realized'" (p. 33). Thanks Switchfoot for raising important questions in your music. Did the rise of Constantine mean the end of Christian mission? While ministering in Bosnia in the Spring of 2011, I visited the Mehmed Paša Sokolović Bridge, the site where some 2500 Bosnian Muslims were massacred by the Serbian army and their bodies thrown in the the Drina River. While it was difficult to imagine such an atrocity happening in the mid-1990s, it was even more troubling to cross the bridge and find this monument dedicated to the bravery of the Serbians. As we gaze at the picture, we find a sword in one hand and a cross in the other--quite a statement of nationalism cloaked in Eastern Orthodox Christianity. As I looked at the monument, I could not help but think of the Emperor Constantine who also put cross-like symbols on the armor of his soldiers--a symbol of an ever growing Christendom (the marriage of church and state) in the Roman Empire that would fully flower by the end of the first millennium. Christianity is a missionary faith. This is certainly evident from the “Great Commissional” type passages of Scripture, verses preached from and visibly posted in modern evangelical missions conferences, but even more so from the overall thrust of Scripture. That is, the mission of God (missio Dei) is the grand narrative of the Old and New Testaments and thus, in the opinion of some scholars, Scripture should be read with a hermeneutic of mission. Whether this approach to Scripture is fully accepted or not, mission remains in the DNA of the Christian faith and the Christian movement prior to the fourth century demonstrated this value. But did mission—proclaiming the death, burial, and resurrection of Christ and ministering to all nations in word and deed—cease with Constantine’s conversion and his giving Christianity a preferred status within the Roman Empire? Did Christendom, which expanded through political, military, and economic power replace Christian mission? In this chapter, I will argue that Christian mission did continue past Constantine, though the narrative certainly becomes more confusing following his rise to power. Beginning with a working definition of mission, I will discuss some representative elements of this diverse history showing examples of Christendom that appear to abandon mission altogether. However, this inquiry will largely reveal accounts of missionaries working within a state-church paradigm or at least approaching mission in full view of political authorities. In terms of scope and limitations, I will focus on missions within or from the Roman Empire from the fourth to eighth centuries. Finally, in my concluding section I will offer some points of reflection for modern Christians, particularly evangelicals, contemplating the history of missions. Learn more about the book HERE or HERE. The historic events leading to the accession of Constantine irrevocably rely on a crucial but obscure rhetorician who taught in Nicomedia. It was a contemporary voice from North Africa that entered this eastern city into the court and life of the emperor, a voice of erudition and of suffering. The writings of Lactantius offer both a philosophical and historical report on the pursuits of the Roman leader who came to champion Christianity in an empire that resisted the new religion. In particular, his writings shaped Constantine’s understanding of the faith and influenced the later religious policies that he would enact. Scholars have established Lactantius as a contributor to the genius of a new religious empire and an inescapable historical voice of that evolution, but they are only beginning to scrutinize his exact influence. This chapter seeks to identify and disaggregate the con- tribution of Lactantius in his fourth-century influence and in his twenty- first-century legacy. In particular, it depicts this influential turn-of-the-fourth-century philosopher using a paradigm of architectural narrative. This is the notion that a historian writes in a way with intentional design, employing a metanarrative that creates not the events but the blueprint of those events— the frame for understanding, the interpretation, the significance, the divine providence of the events, or, to use the language of historical interpretation of Earle Cairns, “history as the product of inquiry.” Yet, for Lactantius, this is not vaticinium ex eventu or a theological spin on events crafted by the victors, but he was himself the champion for a cause of religious freedom that he was able to affect and witness fulfilled in his lifetime. In this way, a historian like Lactantius can be seen as a “narrative architect.” He designed a modified empire based on religious idealism but also records the impulses of the era in a way that history will forever view the development of this new empire. This essay, with an architectural theme, will consider his role as designer, as builder, and as narrator. After dealing with his role in the paradigmatic imperial shift, it will summarize his place in the edifice that we call history. Though approaching the issue historically, Thompson interprets Constantine's story within the Lutheran framework of simul justus et peculator--that followers of Christ (even monarchs) are righteous sinners.